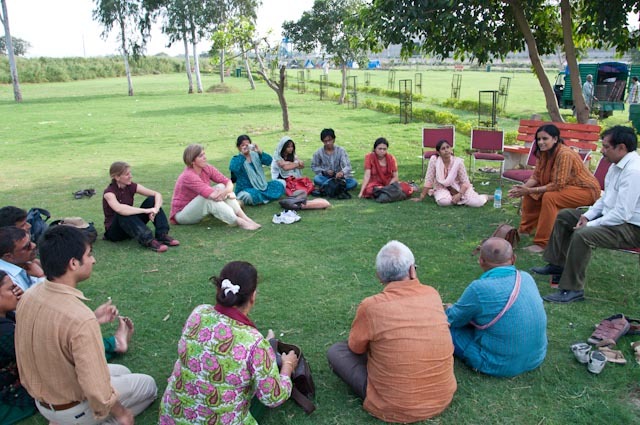 Yamuna Katha: Golden Jubilee of Yamuna’s riverfront destruction? 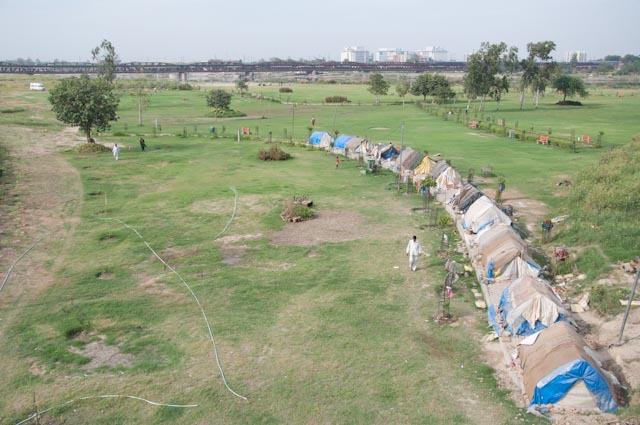 Golden Jubilee of Yamuna’s riverfront destruction? The sprawling green lawns bore no tell tale signs of being a riverfront. It was more of a manicured landscaped garden, which can be anywhere. In the background was the old Loha Pul, the sturdy iron bridge from British vintage. For a layman, the place was a wonderful opportunity to spend time by the river, though invisible from that point. However, it also offered a poignant reminder of the fact that in 2006, hundreds of people were rendered homeless after authorities evicted them forcibly. Soon after its own golden jubilee, the Delhi Development Authority (DDA) decided to give itself, a manicured lawn with several riverfront projects proposed. This was the venue for an open air, open panel discussion: “Moving the Juggernaut called Delhi.” The Yamuna Katha team was joined by Manu Bhatnagar from Indian National Trust for Arts and Cultural Heritage and German elected representative Marie Luise von Halem, also the member of one of the state parliaments in Germany. His Babita, who is an active partner in his business too, drew attention to the fact that almost eight months the river flows with it only garbage and filth. Only three months of monsoon, there is ample water and they get good catch. The discussion then went on touching various aspects such as clear water indicators, ground water recharge, more and more land being reclaimed in the name of bridges and various other structures, definition of city, approach of the administrators, what teachers can do and students do, riverfront development and so on and so forth. Gayatri Chatterjee, one of the core members, could empathies with this feeling. “I like the river-people connect. In fact, I react to the rivers,” she said. On the same lines, the question if the students are taken to the riverfront was posed. 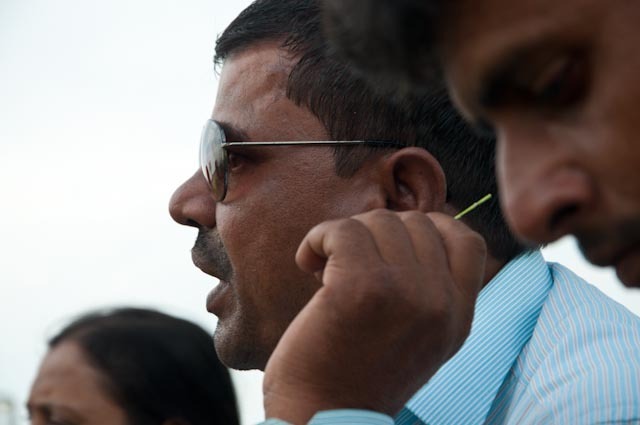 The two teachers Urmi Chakraborty and Vidhu Narayanan admitted the students were not taken to the river. So was the DDA’s latest announcement about riverfront development was discussed threadbare and also discussed was the need to develop and nurture the ‘river connect’. “But will that attempt get my child a job tomorrow?” asked Aparna, playing the devil now. Now, since last 30 years settled in Pune. But when young she had traveled to places all over the country: UP, MP, Bihar and West Bengal etc. 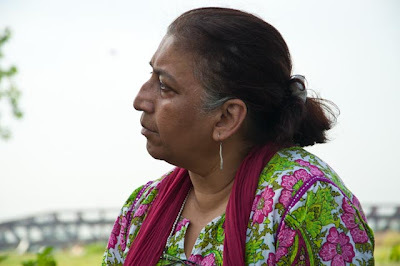 In her late 30s, she remembers coming from Muradnagar along in father’s car and halt at the roadside at the Yamuna. Coming down from the vehicle, they would go straight to the vehicle, which would be tarbuja, kakadi, Kharbuja etc. 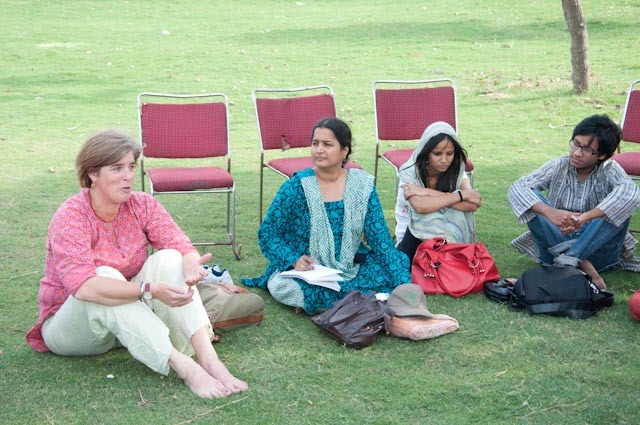 Towards the end, the Yamuna Katha team was joined by another activist for another river. 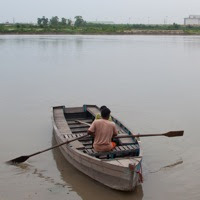 Anil Madhav Dave, who runs Narmada Samagra working in Madhya Pradesh and Gujarat, said, “Human beings think about the river as if his/her efforts would save the river. What can a human with a life span of 70-80 years do for a river that has been flowing since ages?” Dave said. Why can’t the ITO riverfront be like Jagatpur?